When our children come down with an illness, and we as parents are unsure of its cause or what it is, it can be a nightmare. We do everything in our power to get them better, which includes taking them to the hospital, if need be. Just imagine if a situation like that arose while you were vacationing. For one San Diego family, this was their nightmare this past week – except they were nowhere near a medical facility. Charlotte and Eric Kaufman, along with their two young children, Cora, 3 and Lyra, 1 were vacationing aboard their sailboat, Rebel Heart, planning to circumnavigate the globe. Setting sail from Mexico on March 19th, the family was only two weeks into their trip when little Lyra suddenly fell ill, experiencing a rash and high fever. To add to the situation their sailboat also lost power. It was then that the Kaufman’s sent a satellite distress call to the Coast Guard on Thursday April 3rd. 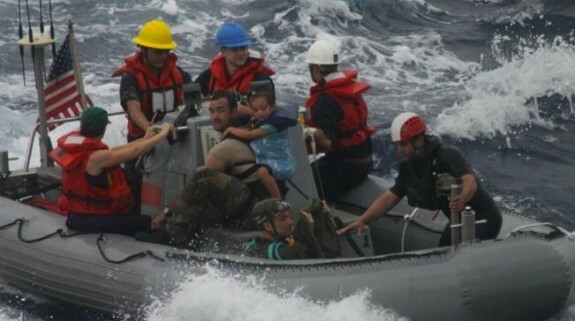 The California Air National Guard’s 129th Rescue Wing dispatched a military transport plane carrying four medics, various gear and medical supplies to the family, who were 1,000 miles off of Mexico’s Pacific coast. The entire family is currently in stable condition, but will be undergoing further medical evaluations, according to a statement from the Coast Guard. There isn’t much hope for the Kaufman’s boat. On Sunday Authorities were in the process of sinking it because it was taking on water.